You might think you have fanboys figured out, but sometimes there's more going under the surface than you might think. As with a lot of things in life, console fanboyism is a matter of perspective. Where one person sees faulty logic, another might see a deep emotional investment in a particular platform. In Issue 292 of The Escapist, Kyle Orland talks about his own experiences with fanboyism, and how his love of Nintendo was about more than just brand loyalty. Long before the internet became an integral part of my life, Tim became my first troll, bad-mouthing the Super NES and its games in a way that seemed perfectly designed to get my ire up. I remember us almost coming to blows during a heated argument over the relative merits of Street Fighter II and Eternal Champions, despite my never actually having played the latter game. As time went on, the growing association between Tim and the Genesis ended up increasing my somewhat irrational hatred for both. But the Genesis was also associated, in my head, with an adolescence I wasn't really ready for at the time. The Genesis was the blood-code-infused version of Mortal Kombat, while the SNES was the care-free childishness of a game like Clay Fighter. The Genesis was the dark palettes and war imagery of Jungle Strike, while the SNES was the bright colors and sci-fi ridiculousness of Mega Man X. 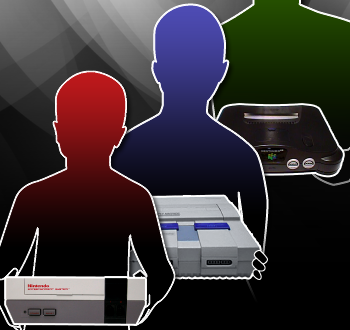 For most kids, this comparison probably made the Genesis even more desirable, but I was a late bloomer, and eager to hold on to a system that let me hold on to a youth that I felt slipping away, even then. Orland says that behind a fanboy's rage and invective, there's a person who's fiercely clinging on to the platform that introduced him or her to gaming. You can read more about it in his article, "The Making and Unmaking of a Nintendo Fanboy."